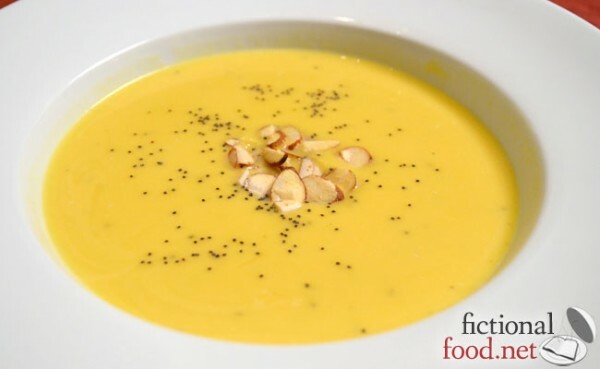 My resolve is almost immediately broken at the first table, which has twenty or so soups, when I encounter a creamy pumpkin brew sprinkled with slivered nuts and tiny black seeds. “I could just eat this all night!” I exclaim. I searched around for a recipe to adapt and settled upon this one from Beyond Sweet and Savory. I couldn’t find butternut squash at my supermarket, so I just bought an acorn squash. It tastes good in the sense that I can tell it tastes yummy, but since I’m not much of a pumpkin eater, it wasn’t really my thing. I remember trying pumpkin juice once and not really caring for it, despite having read how much Harry and the students at Hogwarts love it. I’m really more of a pie and cheesecake kind of pumpkin eater! I do have to say that the almonds went very well with it, though. I reduced the cream a bit in the recipe below as I thought it was a little too much. If you try this with another type of pumpkin, let me know how it is! 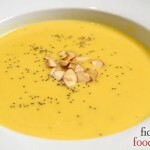 Katniss eats a creamy pumpkin soup with tiny black seeds and slivered nuts in the Capitol. Heat oven to 350 degrees. Cut squash into quarters and scrape off insides and seeds. Place them on a foil lined baking sheet and drizzle with olive oil. Season with thyme and salt. Bake for 1 hour. Let squash cool, then scrape the flesh out into a blender or food processor, discarding any large thyme sprigs. Add chicken or vegetable stock and puree until smooth. Run puree through a sieve and add to a pot. Add heavy cream and heat on high to a boil. Lower heat and simmer for five minutes, then stir in honey. 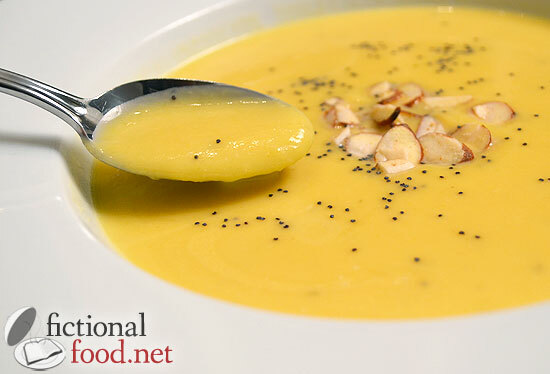 When serving, lightly sprinkle poppy seeds onto the middle of the soup. Drop a little bit of slivered almonds into the middle.